was just perfect to go with my door stamp, and I colored the flowers and pot with markers and water brush. Hop over to Just Add Ink, they are a bunch of talented girls from Australia and play along at their challenge this week. 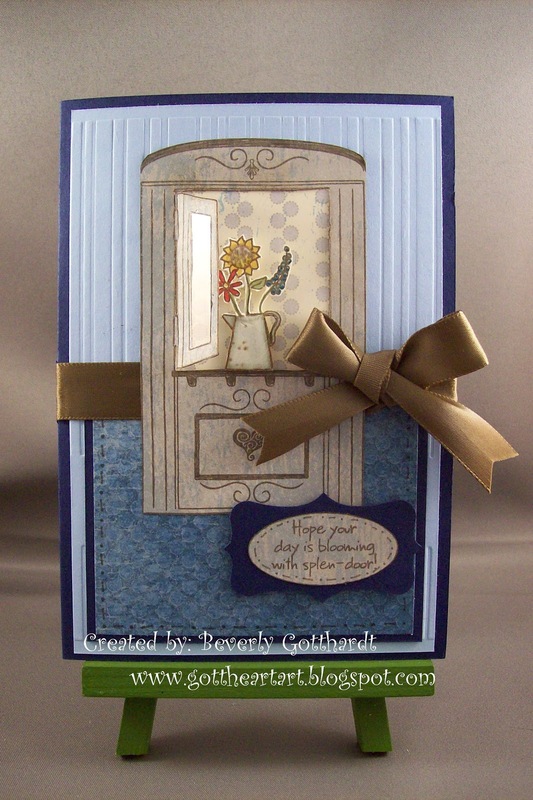 Supplies: Night of Navy Card Blank 4" X 5 1/2", Papers: Stampin Up-Night of Navy, Bashful Blue, Very Vanilla, Blueberry Crisp Designer Series Paper, Stamps: Clear Dollar Stamps-I A-door You, Rubber Stamp Tapestry-heart, Ink: Stampin Up-Soft suede, markers-Pacific Point, Crushed Curry, Pear Pizzazz, Soft Suede, Poppy Parade, Daffodil Delight, Sahara Sand, Baja Breeze, Quick Kutz-stripes label embossing folder, McGill-Vintage Label punch, scrap of acetate, ribbon- Offray, Stampin Up dimensionals. What a beautiful image and a great take on this week's sketch. Love this! Sure looks like it took some time to creat, but well worth it! What a beautiful image that goes so well with this week's sketch at JAI. 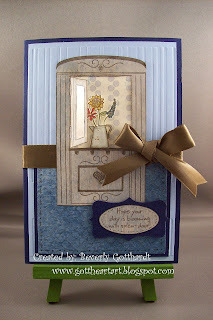 I agree the window looks like it is swinging inwards but it doesn't detract from the beautiful card in any way! Thanks for playing at JAI. Great card and a great stamp well done. This is just stunning. Love it to bits. Just gorgeous.